Jim "Zig" Zigarowski's job is one of great responsibility, honor, and skill. As a mortician at Dover Air Force Base, Zig is the last person to come into contact with fallen soldiers before they're sent to their final resting places. He meticulously prepares the bodies, sometimes performing unbelievable restorations, ensuring each of the deceased gets the honorable treatment they deserve. He's had his fair share of loss, so he works diligently to ensure each family gets one last moment with the person they love. Zig normally manages to keep a professional distance between himself and the people he prepares. When a group of deceased passengers from a downed military plane arrive at the base, he expects business as usual. One name, however, catches his eye. US Army Artist in Residence Nola Brown was among the group aboard the ill-fated flight. Zig immediately is taken to a time years ago when a girl named Nola Brown saved his daughter's life. Now the heroic girl lays on Zig's cold steel table providing him with one last look at the person who gave him some precious extra time with his only daughter. There's just one small problem. The woman on his table isn't Nola Brown! 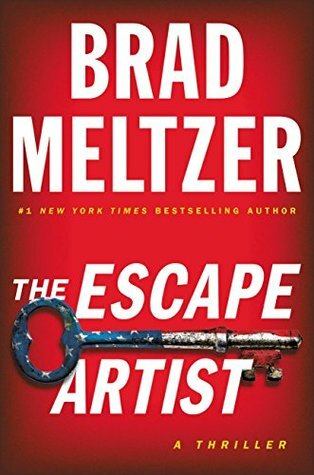 The Escape Artist sees Brad Meltzer combine the intrigue of a deeply hidden government conspiracy with a nuanced story of human loyalty and respect to the ones who've passed away. Meltzer alternates between the present day plot of Zig seeking to find the missing Nola with flashback scenes of Nola's unusual childhood. At first, I found myself struggling to connect with the scenes of the past. Nola's childhood seemed to have little to do with the captivating drama surrounding Zig's quest. Fortunately, the past and present narratives soon began to have more and more to do with each other, creating a richly-drawn plot that kept the pages easily turning. Meltzer weaves a connection between the ongoing fictional conspiracy and the real-life history of famed magician Harry Houdini. These touches of historical fact help to ground the events of the novel in a reality that would be otherwise unbelievable. Each element of the novel adds to the overall appeal, but it is the characters that truly captured my attention. Meltzer writes each of them, from the main characters to supporting cast, with genuine care. Even the candy restocker at the base is given a backstory that adds life to the world of the book. The Escape Artist does everything right, making me eager to dive into another book by Brad Meltzer. This entry was posted on Friday, January 18, 2019 and is filed under Book Review,Brad Meltzer,Conspiracy,Drama,Fiction,Military,The Escape Artist,Thriller. You can follow any responses to this entry through the RSS 2.0. You can leave a response. It definitely seemed like a difficult job, but I was struck by the sense of duty and responsibility it carried. What an unusual storyline and character background! I like to watch government TV shows, so maybe this would be along the same lines. It was certainly a different perspective. If you like those shows, you'll probably enjoy this! Sorry to hear about your illness. Wishing you a speedy recovery! Meltzer has a new nonfiction book out that looks pretty good too! I love backstories on incidental characters. It's just one more piece in the world and I love world building through character development. Great review! I do too! It really adds a depth to the whole world.